The train has been equipped with solar panels, LED lighting and solar sockets. So you've already seen the solar rickshaw and solar car. Now, here comes world's second solar train, Shivalik Express, a normal passenger train, converted into a solar train. The train has been officially launched in the country. It follows the foot steps of Himalayan Queen, which also comes equipped with solar panels. Shivalik Express has been known for its journey between Kalka and Shimla stations. Recently, Northern Railways is exploring the option of converting it into a solar-powered unit, which finally is becoming a reality. The new design of the train comes equipped with LEDs, which has an illumination level of 42 lux in all the seven coaches of the train. Previously, the illumination level was 20 lux. A lot of effort has gone into its making,said, R K Gupta, senior divisional electrical engineer - Ambala division, Northern Railways. 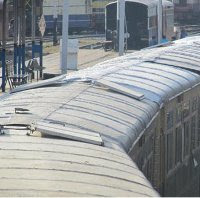 The official revealed that it has taken over two months to implement the solar design on the train. Apart from LED lighting, the train has been installed with solar-powered sockets, which will enable recharging of mobiles and cameras during their journey. The overall cost of converting the train into a solar power unit was around Rs 225,000, which is way too less as compared to savings it will make. The train would save around Rs 150,000 worth diesel every year, Gupta added. Earlier, we had reported about a rickshaw that also runs on solar, termed as soleckshaw . We can expect more of such innovations coming our way courtesy, the bright minds from country's premier institutions, who can play a pivotal role in shaping the green future of India.